A few years ago I was asked to see a patient in the rapid assessment unit with severe pain in the flank. She looked as though she had renal colic and we instituted the usual management, most notably analgesia with IV NSAIDs and eventually opiates. At the time I was firmly on the learning curve for POCUS (point of care USS) so thought I should look and see if there was any evidence of hydronephrosis…… and there was! My first identification of grade 2 hydronephrosis. All was good and the patient was transferred to Urology where they improved overnight. A CT scan taken a few days later was normal and so the patient was advised that they did not have renal colic and that they probably had musculoskeletal pain. I was a little miffed about this and learned several lessons that day (notably – always record your images!). I recently saw the same patient who had similar episodes after the one described above and who does indeed now have a diagnosis of nephrolithiasis after a subsequent CT demonstrated calculi on the day of admission. I can only presume that on the initial occasion she passed a stone between USS and CT thereby delaying a diagnosis until a second episode some months later. So what’s the point? Well, for me I have had a personal journey regarding the use of USS for patients, I’ve learned about image storing, and I would admit that my patient did not get great care as a result, but I’ve also questioned myself regarding the utility of USS in the early assessment of renal colic. I still do it, I still like it and it does affect patient care but I’d also like some lovely reassuring high quality evidence to back me up and to take me out of the dark place I remember. I’ve also had renal colic. It was not very nice and I ended up having CT, USS and plain films to diagnose it. Not only was this rather painful, in retrospect I would have prefered not to have had all that nasty radiation. So I’m always on the look out for something like this from the NEJM. This looks just the biscuit to answer my dilemma. 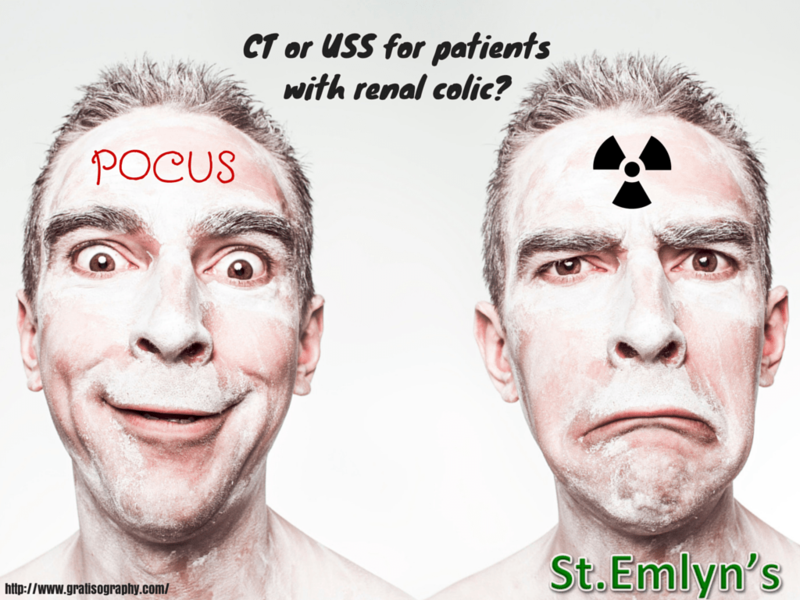 Should we and can we use USS in place of CT for the assessment of patients with suspected nephrolithiasis? I am increasingly concerned about the amount of radiation we deliver to patients for a whole range of reasons and in particular the significant doses associated with abdominal scans should not be underestimated if they become routine for the relatively common complaint of loin pain. OK, this is a randomised controlled trial of a diagnostic intervention. That’s still relatively rare, but it’s great stuff. Many diagnostic trials use before/after designs which cannot account for other aspects of change. Similarly many trials have an end point of diagnosis as compared to gold standard as opposed to patient related outcomes. RCT design is often more conducive to determining POO (patient orientated outcomes). Patients were randomised during hours when both USS and CT were available and that can introduce bias into diagnostic studies. It is a concern but is probably not a fatal flaw. As an emergency physician I want to see trials on ED patients and not those who have been skimmed off into sub speciality services. My ideal cohort would be patients presenting to the ED with pain suspicious for renal colic. The authors in this study have done just that looking at patients in whom renal stones were suspected. They have looked at a wide age range (18-76) and there were few (and understandable) exlusions that I don’t believe significantly affect the external generalisability of the study). The bottom line is that these are the patients that I see in the ED, and indeed I was once one. Overall 2759 patients were assessed in the study. OK. There are three interventions here. Although this is CT vs USS they split USS between those conducted by EPs and those performed by radiologists. This is great as I need to know whether USS performs in the hands of people like me as that’s how and where I want to use it. EPs had training according to ACEP levels which I believe is similar to UK levels of training. Patients were randomised in a 1:1:1 ratio between ED USS, radiologist USS and CT.
I’m an outcome sort of guy, tell me about the outcomes. Good point. As mentioned above we like POO at St.Emlyn’s and that’s what they have looked for. So the patient orientated outcomes were. What about the main results. The headline here is that there were no differences between groups in terms of the patient outcomes listed above. There was obviously a difference in radiation dose for those randomised to CT. Patients had small numbers of missed diagnoses with all three imaging strategies and there were no differences in severe adverse patient outcomes between groups. I’m also interested to see if there were significant differences between the ED and radiology results and there does not appear to be any clinically significant differences seen. So does this mean we don’t do CT’s anymore? Well no. The authors understand this and it is a strength of the study that they followed patients up for a period of time to determine whether they subsequently underwent CT imaging at the discretion of future treating physicians. It’s no surprise that some patients required further imaging later, but it’s also clear that in both the USS groups there was less radiation delivered over time. 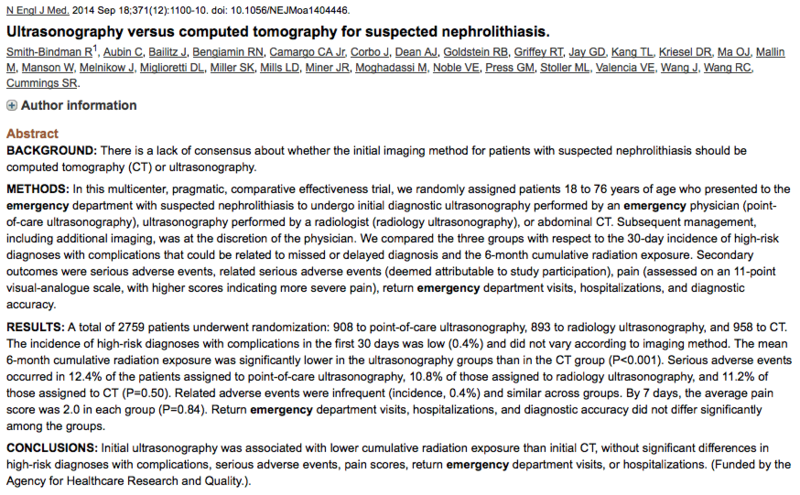 So ED/Radiology USS does decrease overall radiation dose for patients. I’d like to know if there was a specific USS protocol for these patients in the study. Were the operators tasked to look at more than the genitourinary tract, did they have a system and how did they report and retain images. I suspect it is standardised, but I could not see how in the methods or in the online supplementary data. Yes. Go over to the fabulous Ryan Radecki site EM Lit of Note and read what he has to say about this. I think it’s fair to say that we agree. Then, head over to listen to Matt and Mike at the awesome ultrasound pocast on renal USS. You WILL learn something there. 1. Discuss how selection bias may have occurred in this study and what might be the consequences for the results. 2. Discuss the potential problems of not masking the interventions in this study. 3. In table 3 the senstitivity of the three modalities in the diagnosis of nephroliathiasis is given with an associated p value of 0.74. Explain what a p value of 0.74 means in the context of this result. Mild Hydro- typically a clincher. Call it a presumed stone. Treat it like a stone. Return precautions and follow up. Mod Hydro- I involve the pts more in the decision making on these. I lay it out. Generally doing same as mild hydro. We are talking about patients in whom we’ve gathered all the other info: History, Physical, blood in urine? Hx of Stones? ETc.. And, as clinicians, we’re picking up on humanistic thing we may not even realize- Way patient is laying, the tone of voice, the facial expressions, etc. So we’re talking about pts where after all this- we strongly feel they’ve got a stone. Most important thing is to risk stratify and think about the other nasty disease mimics. Having said all this, am playing these guys as above. Curious any differences in strategy? One thing I was surprised about was no great length of stay differences..? What the heck’s going on for 6-7 hrs anyway? Obviously, the big deal and point in the study is radiation (&cost) But I’ll tell ya length of stay for me in these pts has metamorphosed with US first since i’m talking, evaluating, examining & ultrasounding in the same setting. I’m sure this is true for tons of others who are practicing u/s first. Sam – my experience is very similar to yours. Cuts down length of stay. I was surprised that ED POCUS had to effect on LOS. I wonder if more monitoring or more US (i.e. AAA scan in addition to renal) was being performed. I have also discovered 2 patients with single kidneys (congenital) with US. Both required CT scan and one had an obstructing stone. In young patients with classic first-time renal colic presentations, much of what I’m looking for is the presence of 2 kidneys. Thanks, Simon for the great review. Hopefully, it’s only a matter of time before US has greatly replaced CT scan for renal colic, appendicitis etc.